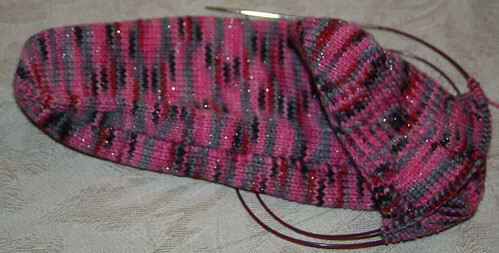 I’m doing a variation on the Kauni Sweater that Stephanie did…I just re-did the pattern. (I don’t like rectangles much). I love this yarn! It is so much fun watching the progressions change! I also purchased my at Astrid’s…and have ordered more things since. I’ve found her service to be wonderful, even from across an ocean! I adore Kauni so much. The colors.. the pretty rainbow colors! I have 2 skeins I’m trying to decide what to do with. Something incredible. That should be one fabulous sweater! Have to agree with the clown thing. I’m not overly fond of them and they are, well… creepy. Just a perception on my part. My cats also go on “bird watch” also on “feral cat watch” or”squirrel watch”… you get the picture. The effect of those changing colors in patterned knitting is just magical! and am hesitant to get wool I haven’t been able to touch. I hope Lucy got a good show. The birds are busy in springtime. I’m with you on the clowns–they creep me out as well. I remember seeing one at a parade when I was small and screaming my lungs out. They make me really uncomfortable. The sweater will be incredible. I haven’t seen any Kauni in person, but it sure looks gorgeous in the photo! Why did YOUR Kauni come in nice neat skeins and MINE came in messy hanks? What am I doing wrong? Bad Karma? Lucy is very cute on bird watch. Does she do that adorable stuttering mew thing that some cats do when they really want to get a bird? My Kauni softened up like butter when I wet blocked it. 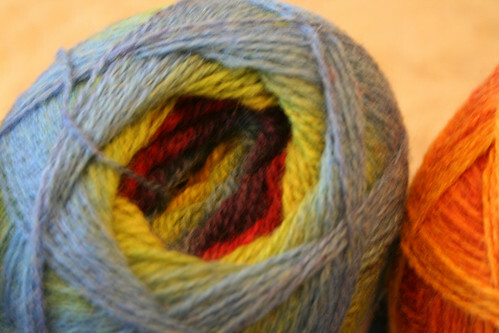 I wore it a lot this winter and it never failed to inspire other knitters because of the fantastic color transitions. Yep, clowns=creepy, mimes=seriously irritating. Only the movie bio of Emmett Kelly made me like him, especially the scene where he sweeps away the spotlight on the ground. Of course, part of his appeal may have been that he wasn’t there in person. Love the yarn, magic that the skeins are the same yarn. That is a really, really beautiful photo of Lucy. 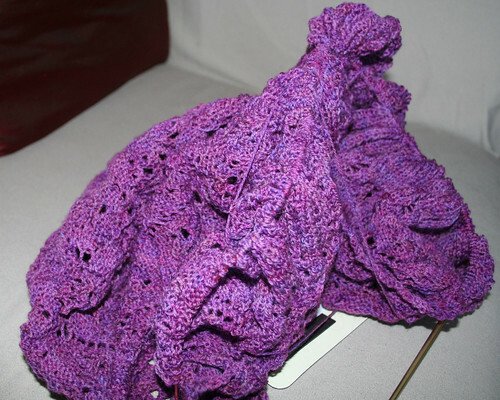 Hurry and finish your shawl, I can’t wait to start seeing pictures of your new sweater. Can’t wait to see that sweater. Will be beautiful!!! Clowns seriously creep me out too – I think a lot of folks feel that way about them. My attitude toward them was not helped by the pictures of John Wayne Gacy dressed as a clown. Astrid is the reason I have one of those enormous zip lock bags (10 or 15 gallon size) stuffed full of sock yarn in the corner of my living room – hiding next to the wall unit! Can someone point me toward some info about the Yarn Tour? Is it in Seattle? When exactly? I will be visiting Seattle the week before Memorial Day & would love to participate since I always buy yarn when I go on vacation anyway – my personal souvenir. Hi Wendy! I just wanted to let you know that Knitorious (www.knitorious.com) in St. Louis, MO (the shop I work for) carries Kauni yarn if international shipping costs is a concern. I can’t wait to see the finished sweater! Another vote for clowns are evil!!!! Oh, I so agree with you! Clowns…..shudder. Never did like ’em but S. King’s “It” really finished it for me. Except for the European clowns…they have a certain glamor. I can’t wait ’till you start that sweater! I have been in awe over that yarn. The colors! Oh, my. I have a hard time getting my head around how it patterns..
Oh dear, another sweater to add to my queue! Lucy looks so intent! Yesterday we had a flock of robins on the lawn outside my office window – and it was only 25 degrees! I think they pecked the barren ground a bit, then decided to hightail it to Connecticut! Another vote for the beauty of that sweater and the yarn you’ve chosen. And another hater of clowns. When I was a little girl (blonde hair, blue eyes) my father took me into Philadelphia for the Mummers parade. We were watching on the side of Broad Street and one of the clowns grabbed me and gave me a kiss! Ugh! My father just laughed but I hated it – and all the orange make-up he smeared all over me. Never wanted anything to do with them since. Since you work in DC, isn’t the circus always in town? Just wondering…. 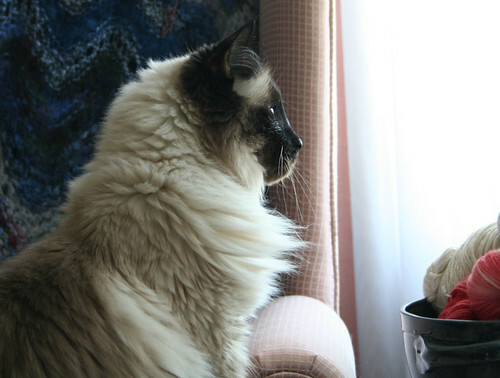 My cat is always on window watch (though now it is mostly birds and later it will be bunnies and squirrels). I just got some green/yellow Kuani from KnitPurl in Oregon to do a variation of the Kuani Cardigan, but now, I think I may look around to see what my options are. I can’t wait to knit it up! WOW.. i can’t wait to watch the sweater progress… no doubt it will be beautiful… have you cast on yet? have you cast on yet? have you cast on yet? Add me to the clown phobics. They just creep me out big time! All the women in my family feel the same way. Must be genetic. Oh, I can’t wait to see this sweater. It sounds very very cool. That’s the only Starmore in Kauni I’ve seen. I don’t care about clowns one way or the other. I used to be absolutely terrified of clowns when I was little. I still cannot stand them. I am super happy that I decided to check out the Dutch Obsession’s Website. Their prices are top notch and they’ve got a fun selection! That linnk to Dutch Obsession is a very dangerous thing. All that sock yarn is way less then I can get it for at my LYS. I find clowns not necessarily creepy, but definitely unsettling. Like Donna, part of it comes from the association with serial killer John Gacy (although I was only 4 when he was arrested), but the major thing is the “clown attack” scene in Poltergeist (my first “scary” movie). Their pricing looks a little odd because they sell it by the gram. So it is $.12 per gram or around $18 per 150 gram ball. They also ship for a flat $6.50 anywhere in the US.